Stampin Artfully: The Stampin' Up! 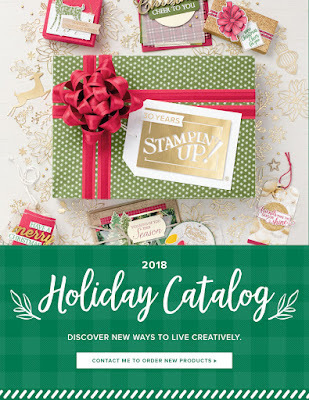 2018 Holiday Catalog Starts Today! The Stampin' Up! 2018 Holiday Catalog Starts Today! I know...I've been MIA for several weeks. I will tell you more about that in a future post. For now, I want to show you this beautiful card I made using products from the new holiday catalog. You will be able to click on the cover of the catalog below to take you to an online version of it. 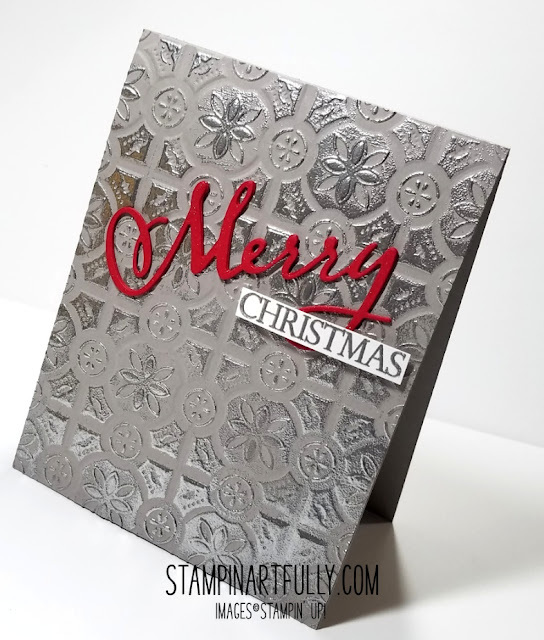 Look how cool the new embossing folder called Tin Tile is! I used Gray Granite cardstock for the card front and the card base. I swiped a Versamark pad over the card front (after using the folder) and embossed it with Silver Stampin' Emboss Powder. I die cut two of the "Merry", glued them together and brushed Clear Wink of Stella on top of it. After embossing the word "Christmas", I hand trimmed it and used Stampin' Dimensionals to pop it up. I think it made a pretty classy card. Click on the photo below to head on over to the online version of the catalog. Love this card! And glad to see you can achieve this effect without a special foil paper...just card stock. TFS.